Learn About: Faith, Hope, Love, Joy, Purity, Prayer, Righteousness, Sanctification, Humility, Fortitude, Perseverance, Confidence, Forgiveness, Christ Blood, Spiritual Warfare, and Your Purpose for Prevailing - And so Much More! 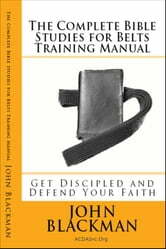 This book include the teaching of all 7 Bible Studies for Belts Volumes in one comprehensive Training Manual for the Student or Instructor to take with them and use. 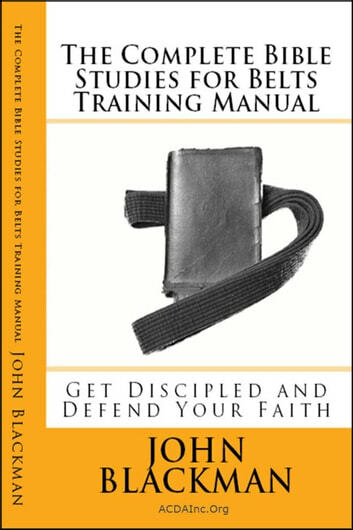 If you are a member of the American Christian Defense Alliance Martial Arts Ministry you may want to purchase this one book instead of the individual Bibles Studies to save you money. This one book has everything you need to learn and grown into a Strong Christian Warrior. We have priced the paperback and this E-Book to save those that purchase it money over the course of their training. And Don't forget to check out Our Book: "Martial Arts Ministry: How To Start A Martial Arts Ministry"
Don't Come the Raw Prawn!